Is this how it works, Uncle Dave? You can’t think of anything else to review, so you just look at another wrestling game? Yes, and if you keep bitching, I’ll turn this car around and drive us straight to another cricket game. Anywho, while 1997 was a pretty good year to be a wrestling fan, it wasn’t so great to be a WWF fan, seeing as they were still reeling from the nWo angle over in WCW and little east coast upstart ECW was building momentum amongst those disillusioned with the current state of the industry. Then, in November, there was some unpleasantness in Montreal, but that’s neither here nor there…but in 1998, we got Acclaim’s WWF War Zone, the first WWF game of the 64-bit era. Much like the real WWF, War Zone faced stiff competition from their WCW counterpart, so the question was whether it would stack up against the much-lauded World Tour. British Bulldog hitting his powerslam on Goldust. Well, not really. The roster here is a bit underwhelming, although it does include most everyone of merit from the period, like Steve Austin, Bret and Owen Hart, Undertaker, Kane, Shawn Michaels, and Triple H before he married into ownership. It’s also noteworthy for featuring all three of Mick Foley’s WWF personas, which is cool, but kind of a cheap way to pad the character count. As for game modes, you have your basic 1-on-1, tag teams, cage matches, gauntlet matches, the Royal Rumble, and the infamous weapons match, where fans toss things like TV’s and the ring bell into the ring to bludgeon your opponent with. For those of you looking to invest a bit more time, there’s Challenge Mode, where you march through everyone else to win the championship. Along the way, previously-defeated foes will pop up to challenge you to a rematch, in the form of one of the gimmick matches. Certain items, like the other Foley characters, can be unlocked through beating Challenge Mode with different characters. All of this sounds pretty good, yes, but that holds up until you actually hit the ring, because unfortunately, the control scheme here is…not intuitive, to say the least. Y’see, Acclaim were apparently gunning for a control scheme that resembles a tourney fighter, as opposed to the grapple system of the THQ games or the button-mashing affairs of the 16-bit days. That’s fine, in and of itself. The problem, though, is that, while it’s not too hard to memorize a handful of button combinations for a certain fighter’s special moves in Mortal Kombat, it’s considerably less feasible to stretch this system out across dozens of moves for every wrestler. Yes, every move besides the most basic punches and kicks require at least a direction to be pushed, often two, before snapping it off. That’s not taking into account the number of move categories here. There’s moves from the ready position, moves from the tieup, moves from behind, moves when your opponent is on the ground, and moves from the top rope. On the upside, there’s a move list you can consult mid-match that helpfully details all the attacks you have in your current situation. Unfortunately, it requires you to pause the game to do so, so unless you have an extremely sharp memory or invest a LOT of time with one wrestler, your matches are going to consist of a lot of pausing and unpausing. Assuming you can get used to the convoluted controls, you’ll notice the health meters work a little differently than normal, as well. You start off with a bright green health bar, and when it depletes, it’s replaced by a blue Stun meter, and until it depletes, your opponent is free to waffle you with impunity. Then, the meter changes colors, to yellow, orange, and eventually red. While you can put your opponent on his back quite a few times, the only time they’ll actually stay down is if they’re stunned, and if you’re too close to another wrestler while they’re getting up, you’ll be met with a shove, which leads to some accidentally silly moments when you hit a big move like a piledriver and your opponent pops up before you do and gives you a wimpy little push. When you finally manage to get your opponent’s health into the red, you can unleash your wrestler’s finishing move, but I hope you knew what the button combo for it was going in, because in one of the most indefensible moves I’ve ever seen a wrestling game pull, THE GAME NEVER TELLS YOU HOW TO EXECUTE FINISHING MOVES. Nowhere in the training mode nor the move list does it tell you how to pull them off, and I can only assume this was a nefarious ploy to sell strategy guides to desperate marks who just wanted to know how to do a Stone Cold Stunner. Why no, I’m not at all bitter about Bret getting screwed, why do you ask? Now, all that being said, there are actually some good things going for War Zone. For one, the developers did put some effort into creating a more authentic WWF experience. Each wrestler does get their theme music, although the quality is actually higher in WWF Raw for Super Nintendo (I’m not joking). During Challenge Mode, your wrestler actually gets an entrance and poses at the top of the ramp. For the first time, we also get live voice commentary during matches, courtesy of Vince McMahon and Jim Ross, although sadly, Good Ol’ JR never proclaims that someone has been broken in half nor demands that someone stop the damn match. The crowd actively gets in on the action here as well. If you piece together enough varied offense, they’ll start a chant which effectively doubles your attack strength and makes it harder to pin you or lock in a submission hold. They’ll also randomly blurt out statements based on who’s in the ring, which is weird, but oddly memorable. 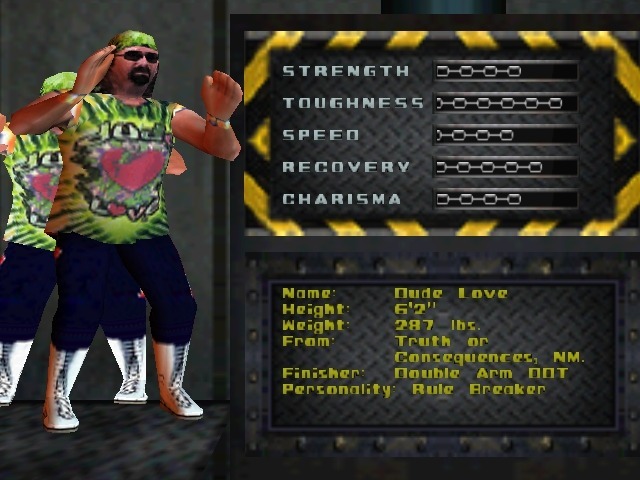 There’s also a Create-a-Wrestler feature here, although Fire Pro it’s not. You don’t have a whole lot of appearance options, and you have to select from a premade moveset instead of selecting moves one by one, but hey, it’s a start. Y’see kids, Kane used to look a LOT different. Visually, War Zone’s not one to write home about. Wrestlers look blocky and move stiffly, complete with weird mitten hands and a weird stance that looks more karate than pro graps. Collision detection is a bit wonky as well, so a lot of strikes look like they’ve missed considerably. During one-on-one matches, the camera likes to jump to different angles during certain moves, but thankfully, this isn’t the case in multi-man matches. Everyone gets at least two sets of ring attire as well, selected with a button combo while choosing a wrestler, and Steve Austin and Goldust also have two extra costumes to unlock, as well. It should also be pointed out that in the PlayStation version, grudge matches feature FMV clips of the other wrestler calling you out, whereas the N64 version just shows them warming up on a punching bag. It’s a minor feature, to be sure, but it is unfortunate to miss out on the unadulterated joy of watching Ahmed Johnson attempt to cut a promo. Let’s face it, WWF War Zone isn’t great. It’s not the worst wrestling game, by any stretch, and being the only WWF game for the N64 definitely bought it some time, but the control scheme definitely takes a lot of wind out of its sails. It does have some advantages over World Tour, what with the actual voice commentary and Create-a-Wrestler feature, as rudimentary as it is, but THQ’s offering was clearly the superior effort. Alas, the wonky engine Acclaim started here would make three more appearances, with only some minor tweaks, so N64 wrestling fans would have to wait a while to see the definitive 64-bit WWF experience, but War Zone is worth a look if you’re a huge fan of this era of wrestling or you want to see why plugging a tourney fighter’s controls into a wrestling game isn’t a great idea. Pretty good snapshot of the WWF roster at the time, variety of match types, even a basic Create-a-Wrestler is better than nothing. The control scheme is absolute dreck under the best of circumstances, and you have to have outside help to know how to do finishers. I actually don’t think the game is that bad, it was a step up from the previous pure arcade games (WWF Wrestlemania: The Arcade Game and WWF In your House) with better controls (still versus fighter like but a lot more intuitive) and the graphical presentation was actually top notch….at least on the Playstation where the wrestlers looked good and you got all the infamous promo videos that either sucked (Bret Hart, he can’t talk), where what you expected (Steve Austin going crazy) and of course Ahmed Johnson….saying….something?! Graphics were also good for the time, compared to AKI’s blocky wrestlers it looked a lot more realistic. The create-a-wrestler feature was awesome for it’s time. WWF Attitude is a lot better, WWF No Mercy has some better gameplay, Fire Pro Wrestling still kills all licensed wrestling games but i think i would give WWF Warzone 3 stars and WWF Attitude 3 1/2 for having various ideas from videos to career mode, great CAW and i don’t think the controls are bad, they just take some time to learn.